Civilians were deliberately targeted by Turkish forces during mass operations in the eastern Kurdish-majority cities in 2015. This revelation is being made by an ex-policeman who was with the special operations, before being purged as part of a crackdown in Turkey. The former cop expressed remorse about the 2015 attacks. The cop, who prefers to be called Ahmet Gun due to security concerns, lives in a refugee camp in Switzerland where he sought refuge after spending thirteen months in a Turkish prison. He was accused of links with the Gulen movement. The Turkish government views the Gulen movement as a terrorist organisation. It’s also accused of being behind the failed coup in July 2015. 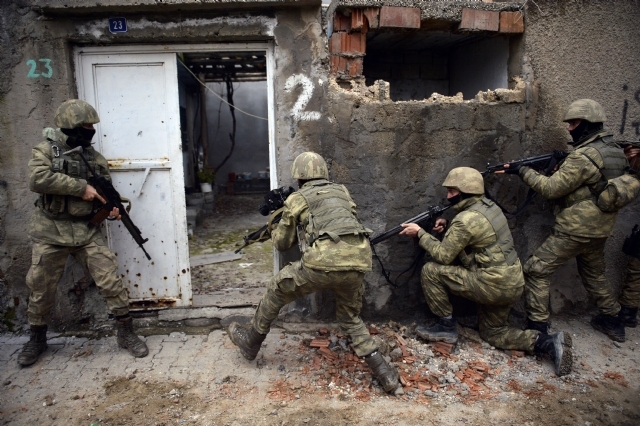 The cop alleges that Turkish forces were behind attacks on locals. Ankara, following a two and a year-old abortive peace process with the Kurdistan Workers’ Party (PKK), designated as a terrorist organisation by the state, started a wide-scale operation in 2015 in many districts including Sur, Cizre, and Nusaybin, where PKK fighters dug trenches to fend off Turkish forces. One ex-policeman, after witnessing both a ceasefire during the peace process and intense fights immediately after, told Medyabold, an online Turkish news outlet, he was blacklisted as he opposed “brutal” conduct of his colleagues. He claims whoever opposed the inhuman treatment of the police against Kurdish civilians was blacklisted and labelled as Gulenist, only to be dismissed later. “When PKK forces were digging ditches in the cities during the peace process, Turkish police and the army didn’t interfere and whoever criticised police chiefs for not interfering were blacklisted. “When the government stopped the peace process and started operations against PKK and harmed civilians, critics who were against human rights abuses were branded as Gulenist,” Gun said. The peace talks were a bid to end the three-decades-long and deadly fight between the Turkish state and Kurdish insurgents. Shortly after this though, Ankara started a war with PKK. While this was on, many locals were told to leave the region as several districts and towns were destroyed. Hundreds of thousands of people fled the region, according to a report released by the office of the United Nations Human Rights Commission, many others refused or couldn’t manage to leave their homelands and were stuck inside their houses due to a curfew. “I want to clear my name, may God forgive me for joining the Cizre operation. I never fired a bullet to any civilians and never harmed any properties, but I should have simply resigned from the police special unit. Now I am dismissed. It would be an honourable act to resign. I shouldn’t have been in that environment. I shouldn’t have written my name in the history book of the ditch operations,” a regretful Gun said. Gun becomes too emotional when sharing one of his most painful memories, which shows the desperation of the people in the region. Gun said: “When we sieged the street of Cizre, an old man came out of his house with a sick two years old grandchild. The kid was so sick. One of nationalist police shot a warning bullet to scare the old man to force him to turn back to his house. “But the old man didn’t step back. With his broken Turkish, he said ‘either you kill both of us or have this child treated’. But a colleague of mine told him he should have stood bravely while PKK was excavating ditches. Gun said despite all his pleading, the police didn’t allow this man to take his grandchild to the hospital. Gun alleged state forces became more ruthless as the operation took longer than expected and after many security forces lost their lives during the clashes. “The saddest part of the operations was the police’s shooting of ambulances. People were hiding in the basements, they were calling ambulances during the first days of the operations to carry elders and injured people to the hospitals, but the police were shooting the ambulances,” Gun said. “Tank bullets brought houses up and down. This kind of operation never applied to the basements but high explosive tank ammunitions killed almost all of them. Beside my observations, dozens of children’s dead bodies, burned children women bodies were reported by international bodies,” he added. The Peoples’ Democratic Party (HDP), the biggest party in Turkey’s mainly Kurdish southeast, claimed more than 200 civilians were killed, and while Turkish media reported more than 530 security forces were killed during the operations. During Turkey’s operations in the Kurdish-majority cities, drawings of nationalistic and Islamist slogans on the walls, and photos taken by security forces with ultra-nationalistic messages within the apartments of locals raided by security forces were rebuffed by many. Gun claims radical Islamist ideologies spread among his colleagues in recent years as similar to Jihadist groups’ ideologies in Syria. “I saw those writings on the walls such as ‘Asadullah Team (Soldiers of Asadullah).’ Some name themselves with a reference to ancient Ottoman army groups. A few years ago, I had never witnessed this kind of rhetoric within the security forces,” he says. According to Gun, keeping operations in Kurdish cities long was a strategy of President Recep Tayyip Erdogan and his governing AKP, as they feared a loss in the June 7, 2015, general elections. In those elections, the Kurdish Peoples’ Democratic Party (HDP) took 80 seats in the Parliament, an eye-popping success. “Erdogan decided to punish them, as part of his plan for a snap election and improving his party’s votes,” Gun argues. “The police did not receive enough logistics from time to time and the operation took longer than expected,” he alleges. Gun was seriously wounded while the armed vehicle he was in hit a mine bomb and exploded on 29 June 2016 in Mardin’s Derik town. “God pulled me out of those unlawful operations,” he said. He was still hospitalised when the failed coup took place, soon afterwards he learnt of his suspension from the duty with an executive order. “I and my wife were never worried, despite having the responsibility of our kids. I was simply released from being a part of all police wrongdoings,” he said. Gun was arrested and charged with downloading “Bylock into his phone”, an encrypted messaging application labelled by the Turkish government as a sign of being part of the Gulen movement. “The Judge ordered my arrest within seven minutes, while I was still bandaged on my legs and arms due to the wounds I got during the operation. I requested from police not to handcuff me in front of my family but they refused. I spent thirteen months in a Gaziantep prison. I never received any medical treatment. The room was for six people but was shared by fourteen inmates. I was then sentenced to six years and three months in jail on charges of being a member of a terrorist organisation,” said Gun. After he was released by the court pending a trial, he was not given a job and is now struggling financially. He, his wife and their three children left Turkey illegally on a boat for Greece, through Maritsa River. They managed to reach Switzerland, living in a refugee camp. “Ditches operations, my injuries, arrests and a journey as a refugee have badly affected my wife psychologically,” the ex-cop said with a tinge of regret. “My wife takes strong medicines. She started to use 10 milligrams, then increased to 20 milligrams in Greece and now the doctor gives her 40 milligrams. She can’t forget the painful past,” he said. Apart from his wounds, Turkey’s damage will take years to fix. “Kurdish people experienced terrible conditions. The consequences of the operations in the region will be too costly for my country,” Gun warns.